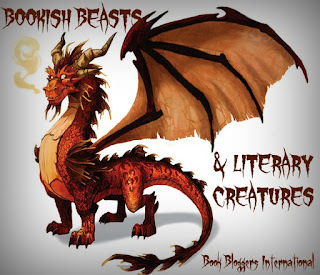 Book Bloggers International: BOOKISH BEASTS: More and More Beasts! Welcome to a quick addition to our BOOKISH BEASTS feature from January! We have one last guest for you on this first day of February because we knew that you just could not get enough of our literary creatures. Please take a few minutes to welcome Booktuber, Johannah. She going to talk about beasts in general, and there is lots of them to mention. Enjoy! Beasts have been roaming around here for centuries. Tigers, Lions and Bears Oh my! But even more so in literature. I’m going to be listing some books and referencing some of the beasts mentioned in the books here. I like lists, it’s easy to get my thoughts down that way and it reads less like a silly term paper from college. I’m also including some of my favorite books in this! I loved how She shaped Sirens to be evil mermaids to lure men down to the deep blue ocean. Granted in her story I think it was a guy. Now, that dates back to Mythology and how Sirens would use their beautiful voices to sing sailors to their watery grave. When I was in the Navy and we were out to sea for long periods of time - I’d joke and tell them I saw a Siren in the water and to not fall over board. Ron is terrified of spiders - An Acromantula or Aragog is a giant spider in the dark forest who’s actually blind and owned by Hagrid. The Acromantula is from the rainforests in southeast Asia and a wizard-bred species created to guard dwellings or treasures. Technically speaking - a spider isn’t a beast but one of this size I think we can say it is. You’re probably thinking that book doesn’t have any beasts in it - Oh but it does. The beast is in your own head. What if your family and friends think you're going crazy because according to them it is ALL in your head. But to Mara Dyer - it isn’t ALL in her head. This book will have you second guessing if she is or isn’t crazy that is for sure! This has a couple ‘beasts’ in it - the deadly plague that threatens to wipe out the population as everyone tries to scramble for a cure before it takes everyone. And last but not least Cinders evil step mother and sister. It’s a different type of retelling of Cinderella that I LOVED SO much more than the Disney version. This beast is a nasty one if you're not careful with what you're thinking - like literally - Everyone in this town can hear everyone else’s thoughts and that can be very dangerous. This book I didn’t actually physically read - my 7th grade teacher read the greek mythology parts to us and had us draw out some of the people or creatures in it like King Midas's touch turned anything into Gold - hey that’s what he wished for and that’s what he got! Dummy - you can’t eat gold. Or Hades the god of the underworld - I remember drawing him on a throne surrounded by the dead and a sign that said once you enter you can not leave. These are just a few of the books with evil beasts in them - some are actual ones and some are ones you create yourself or ones that just happen to be beasts of another nature altogether. Writing this has made me realize I need to read more fantasy books and maybe I’d come across more. HA HA!!! The premise of The Knife of Never Letting Go kind of reminds of that classic Twilight Zone episode, about a boy who could read minds and would turn you in a jack-in-a-box if he didn't like your thoughts. Anyway, great list. I should check some of these books out.